Come and join us for a family-event at the KC Arts Center – Home of SRT (Singapore Repertory Theatre)! 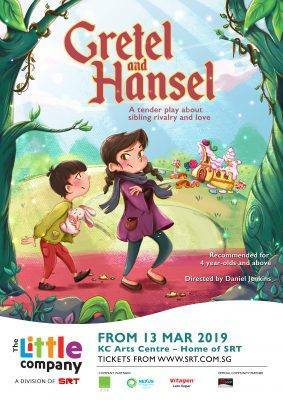 Gretel and Hansel is based on a twist of the well-known fairy tale by the Brothers Grimm. When Hansel arrives, it upsets the balance of Gretel’s life completely. Her little brother has turned everything upside down. When their parents abandon them in the forest and they end up at the witch’s house, she is very tempted to push him into the oven with their jailer and get rid of him forever… By what tortuous route does one become a big sister? Learn about family and responsibility through a theatre outing like no other! This show is recommended for aged 4 years old and above. Please note that cancellation after deadline or no show will be charged full amount.